I’m told that I learned to hand-sew before I learned to read – apparently I was four years old when I clamoured to help my Granny mend clothes. In hindsight I was probably just seeking attention but ‘the biter was bit’ and I’ve been sewing by hand ever since. I’ve been making kilts since 1975. 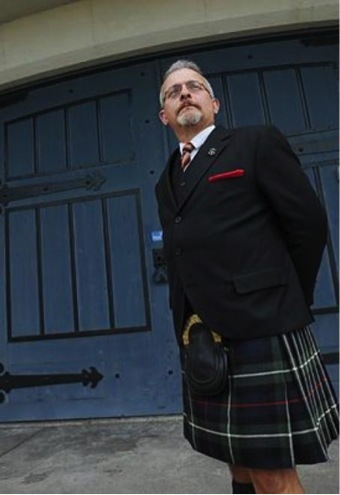 I got my start as a Kiltmaker during my first winter with the Seaforth Highlanders of Canada, where I was attached to the Clothing Stores under the direction of the Quartermaster Sergeant. There was a ‘condemned’ kilt being cut up for tartan-patches. I ‘dissected’ it in order to see how a kilt was made. From there I started refurbishing and repairing kilts for the other soldiers and eventually started making kilts myself. It was at about this time that I was also lucky enough to find an old Kiltmaker who (grudgingly) took me on as an apprentice.